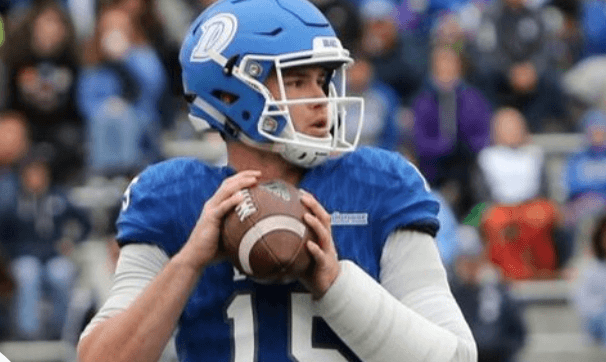 Drake quarterback Grant Kraemer is one player that Matt Anzio views as a Hidden Gem in the 2019 NFL Draft. Who else will make his volume 4 list of offensive skill position Hidden Gems? Kraemer has good clarity to avoid pass rush & push the ball down the field. There has been a few publications including right here on draft diamonds that featured Kraemer . Had 3 TD passes against Iowa State Still very much a sleeper from the small school of Drake. Going through tape of about a half dozen sleepers before i decided on the gunslinger from Northern Cali. Looks solid when he is able to set his feet to step into a throw but what impresses me the most about Kraemer’s game is the fact he can make some nice throws on the move. When his feet are not set with little leverage even on his tippy toes at times. Although his pocket was breaking down on the regular he showed the elusiveness toughness to keep plays alive with his feet & arm. An intelligent player that studies plays recogniction any weakness in a D formation. Long ball looks legit can get some velocity behind his throws get them out in front his WR’s. Escape ability quick feet strong thick thighs legs not easy to take down. precision throws to the sideline leaving room for the wideout to make the grab. Makes throws in tight windows surveying the field at all times like a watchman at the looney bin. He doesn’t take his eyes off his targets utilizing the narrowest of opportunities. Fitting the ball in tight areas or out throwing the defense with his strong arm improved accuracy in his final year at Drake. A QB you can tell studies tape not only of opponents but other QB’s whether pro or at the Collegiate level. Learning from not only his success but from his mistakes on the field. Slept on is an understatement & I get it it’s Drake but currently ranked the number 57 QB by Draft Scout.com. Which is no knock on them as i love the site but that is where he stands in the majority’s eyes. I’m just not the majority …. Jazz is more like a Symphony in motion. Big body wide out that had 6 games with over 100 yds receiving on the season. A LSU transfer he really adjusted well to his new team. 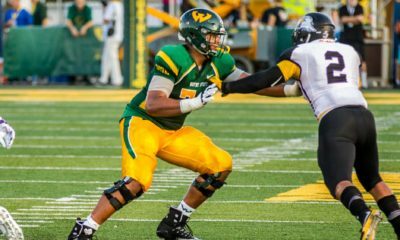 Despite being a small school still the name Jazz Ferguson is whispered among even the most mainstream draft talking heads. Uses his gift of his size reach speed to win but could develop into a more well rounded wide out on the right team with plenty of practice & film study. Reach ability to flex out get the ball with a amazing catch radius. Hands like magnets over 34 ‘ arms big athletic frame can be a handful for even the best DB’s. Big fast 4.45 athlete that is capable of big play at any moment. Can use his hands to get off press on the line & create seperation to complete his route. Route finisher keeps working the tops of routes can out muscle his way to the completion. Natural ball tracking finding the ball with instincts to make some challenging catches. Follows blocks well on the short passes or screen game combined with his blazing speed make him a great option in the short game. Gets his hands in the inside of DB’s shoulder to knock them off balene or off the spot. Goes hard on the top of routes not giving up extending the play. Has all the ability in the world just needs the right team WR coach to help him develop into s star. No issue that can not be fixed when your dealing with a talented physical athletic savage Ferguson is as a player. Has had some drop issues that can be an easy fix with constant repetition. 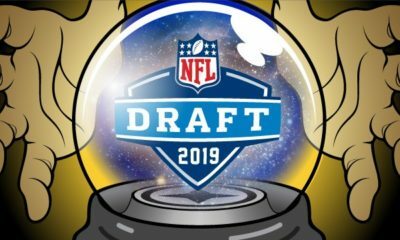 Should be a low risk high reward type player to take a day 3 flyer on or a quality UDFA. Jachin Watkins is Rockin some impressive size speed & moves. Exciting sleeper back that is way above average for his size on not only quickness bet elusiveness is also a thing of beauty. Watkins is a natural born pass catcher as well can juke DB & LB’s out their cleats. Did not receive a Pro Day like many of these small school prospects. Honestly believe he deserves a shot to compete in a camp this spring.Had 3 TD’s on the season received 2 All Star Invites. HIs stats don’t indicate anything special but I advise to watch the film. Start explodes off the line for a big back with the field vision to follow blockers anticipate defenders. Can be a inside banger or hit the outside on tosses or sweeps has enough burst.Good vision to get the most out of outside runs. Body movement skills are an area to pay attention of. He can cut like a sushi knife, juke spin leap has a fun arsenal of athletic moves to make defenders miss. Follows the blocks to the outside well keeps good pad level finishes his runs hard. If he was afforded a Pro Day he would be in consideration for a local day or camp tryout. My guess he would run in the 4.5 range prob turn heads with a ridiculous vert from watching him jump over defenders heads like they where 2 feet tall. Not a ton of milage on the tread. Shows patience the ability to time his spins turn on the jets at the right time. Has the power to push a pile or shrug off a defender really strong runner if needed but has the finesse feet to avoid tackles not just take em on head on. A strong blocker holds his ground good blocking technique stance can help in all 3 phases. Run, catch & block think he is worth a glance. Has ST experience really a Jachin of all trades, excuse my ridiculous puns. True Hybrid moves like many outside wideouts but Big Physical like a Inline Tight End! Has the height block ability with the frame to pack on muscle mass to become a In line TE. Although he shows the needed burst route running to become a wide out whether that be in the slot or outside he shows some versatility size length to find his way on a roster & stick. Had 709 yards 4 TDs receiving his SR averaging almost 80 yds a game. Honestly believe he has at least Flanker type long speed if not number 1 wide out capability. Burst of the line gaining momentum making some diving catches. His catch radius is next level with the ball skills to match. Can move runs solid routes create separation his reach extension are ridiculous. YAC is outstanding gets in & out of breaks quickly & effectively. Has good hands can win the 50/50 balls most the time. Does Not get jammed up easy hard to guard tough hard nose player that can win with his speed toughness or crafty skills to create seperation. Has the ability to make big plays on the regular. Durable not going down on the first hit has some good juke moves for a big weapon. Can get out on the perimeter or stay in tight on blocking assignments seems to be a strong point. If i’m a GM or scout that is something i am looking at closely cause blocking big wide outs or even TE’s are rare these days. I’ve rarely featured 2 prospects from the same school on the same report unless its a All Star game but Terrance & Bryant from FTI are worth an exception. Both these guys impose there physical will while still having the athletic attributes to make tacklers miss. He most certainly deserves a shot at a rookie mini camp. Pretty hard to not be impressed with his tape & Pro Day sure i am not alone. Green is one of the most explosive returners/ WR’s with the ball in his possession in the Nation. Was a Preseason Biltekoff & Paul Hornung award watch list honoree for outstanding KR, PR, ST & as a weapon in the pass game. How on earth they are sleeping on this prospect is beyond me. Maybe because his height although we see guys this size have undeniable success in the return & pass game. So maybe it’s the small school status? 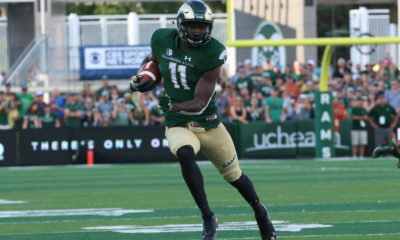 No matter the reason behind this oversight Green had a crazy 1,048 yds from scrimmage & 10 TD’s in 2018. Had a career of 3,190 yds from scrimmage with 24 TD’s. Also played in every single game in his entire 4 year career in college. Tell me again how come i am not hearing the name Marcus Green on all these sleeper lists? No matter your height when you are able to burn past the DB’s like they are statues then height doesn’t mean a dang thing. Supreme route runner always working his quick feet body movement to create space. Tracks the ball, speeds up or slows down has good ball reaction with reliable hands. Has & can be used like a RB on sweeps reverses or tosses has the type of explosion to stretch the D getting out in front of their angels. Runs like a back with the ball in his hands good head fake, stutter step & jump cut. Puts is shoulder down powers his way for the extra yard or two. Superstar in the return game looks like a BMW outrunning a bunch of big wheels. Can stop start make adjustments effortlessly. His field awareness ability to see his blocks develop in the return game is something special to witness. Type of prospect that can sneak on the back end of a roster & stick he is going to turn heads during camp or preseason. Bryant will Run thru Defenders like a Wet Paper Bag. Excellent vision before the snap able to figure a path go untouched for 10-15 yds. Powerful lower half tree trunk legs to push , a heavy lean to finish runs off much stream as a coal engine train. Stout power back that can get the extra yard or help protect a QB . Has a good body type for a runner & blocker think his potential is good. Good vision patience quick witted instincts to work his way thru his blocks to penetrate a D for a big run. Can break tackles push piles get finish like a savage. Tough physical downhill no nonsense thumper. Get out in front like a FB lay down a block to spring his teammate. Selfless type of player that might not have flashy numbers but recognized as a true team player. A guy that can run block play ST willingness to do whatever is asked. Excited for any opportunity to be a Pro. Think he tested pretty well for a big dawg his vert is off the charts shows he has the power to pound the rock but also hold up very well in blocking. Physical down hill smashmouth back with obvious explosive burst & shifty movement skills. Also ran some receiving drills at his pro day which i watched. Has very natural hands runs routes well gets in & out of breaks like a slot wide out. Could be a weapon in both run & pass game looks for Bryant to get an opportunity to showcase his abilities this spring.